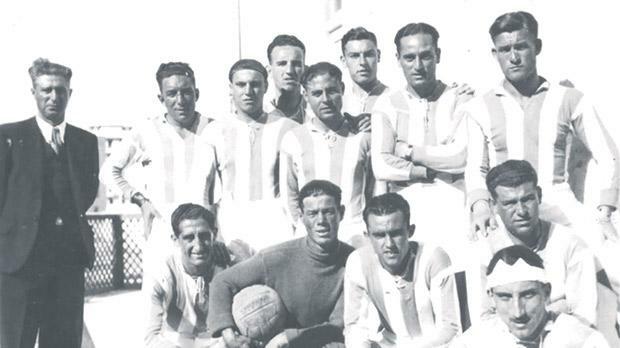 A photograph of the Floriana FC team in the early 1930s. The 1930-31 Civilian Football League began on November 30 with the match between Floriana and Ħamrun Spartans. The Spartans had their opponents on the run for the greater part of the match. They only needed a goal to set them on fire but in the dying minutes, two quick strikes by Cauchi and Bonello gave the Greens a rather flattering 2-0 victory. Valletta opened very strongly against Sliema but much against the run of play ‘Kicks’ Scicluna opened the scoring for the Blues. The goal roused Valletta and, after 10 minutes of continuous hammering on Sliema’s fort, Merola equalised. During the second half, both Joe Nicholl and Johnnie Perrin distinguished themselves with some first-class saves to keep their nets intact for the rest of the game. On December 14, 1930 Valletta took an early lead against Floriana when Abela scored from the spot. However, they enjoyed the lead for only two minutes. A cross-shot from Alamango was misjudged by two City defenders and Cauchi nipped in to even the scores. The first half was drawing to its end when Scicluna scored what proved to be the winning goal for Floriana. With the Greens picking up maximum spoils from their first two matches, the Wanderers could not afford to drop points when they met the Spartans. Play was keen and full of goalmouth incidents. At one point, Sliema led 2-0 but before the interval Brincau reduced the arrears for the Spartans. In the second half, Sliema played the best football but in the very last minute, Gruppetta netted a dramatic equaliser. A huge crowd of supporters filled every corner of the old Empire Sports Ground for the clash between Valletta and Ħamrun. The Spartans were the first to attack but Valletta managed to ward off the challenge and scored the opener when Falzon headed in from a cross. In the second half, the Spartans held territorial edge but it was Valletta who scored again when goalkeeper Sciberras misjudged the swerve of the ball sent in by Zammit from outside the box. Yet, the Spartans obtained their just reward when Azzopardi dashed in to head in a centre from Brincat past Perrin. The Reds now went all out for a second goal but it was Valletta who scored again. The first round was completed on January 4, 1931 with the match between the ‘Old Firm’ rivals. During the early minutes, Sliema missed a handful of chances. Surviving these perils, the Greens struck back and scored the goal which eventually was to give them the points. Bonello met a perfect pass from Pawlu Friggieri and smashed his shot into the net. Floriana began the second round of the league with a 3-0 victory over a depleted Spartans side as the Wanderers won their first league match against Valletta on January 21 to revive their dwindling hopes of winning the championship. After only 14 minutes, Sliema were already 3-0 in front. Bertie Busuttil, brother of the famous Frankie Busuttil, was given his brother’s no.9 jersey before kick-off. A one-time defender, Bertie Busuttil celebrated the occasion with two goals which did credit to his brother’s reputation. The other goal was scored by Vella who was making his debut for the Wanderers. Valletta staged a comeback after the break and goals by Zammit and Merola put them back in contention. During the last minutes Valletta pressed hard but at the final whistle the Wanderers still led 3-2. On January 27, 1931 Floriana made sure of the championship with a somewhat easy 3-0 victory over Valletta. The Citizens never looked like denying Floriana their prize. The only time they troubled their opponents was in the opening 15 minutes. Floriana soon settled down and started to launch one attack after the other. For all their pressing, however, they would not have gone ahead if Vella had not committed a classic own goal by a double-kick a few minutes before half-time. Another mistake by Vella gave Floriana another gift goal soon after the restart. The right-back, under the impression that the ball had gone into touch, allowed Agius to cut into the area. The outside-left passed to Cauchi who, unmarked in front of goal, scored. A few minutes later Cauchi scored the third goal.